Boating is now his passion and his father is now 94 years old and still enjoys sailing with Cal and his wife and friends. Cal and his wife Marty are USCG certified 50 ton captains and spend as much time as possible on their 42 ft. Fountaine Pajot yacht in West Palm Beach, FL. They enjoy meeting new people, especially cruisers, racing their boat and helping others live the dream that they have. They have owned their yacht for 10 years now and have equipped it to be as energy efficient as possible. Cal especially enjoys sharing what he has learned and helping sailors find the boat that best suits them. 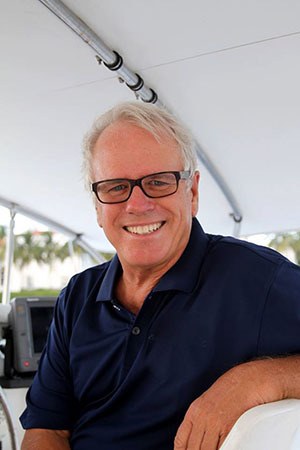 Cal now serves as 5 Ocean’s Associate Broker in West Palm Beach and his vast experience as a broker and cruiser are welcome additions to 5 Ocean’s expert team.